Pull out the Cryptographic Sequencer, then hold LB + RT and rotate the Right Analog-stick clockwise ten times to make Batman's head and all enemy head's larger. Repeat the code to disable its effect. Search the indicated locations to find all 24 Anarky Tags and get the "Voice Of The People" achievement. They also count towards the "First Riddler Trophy" achievement, which requires you to find all collectibles in the game. You can see which collectibles you have found by pressing Back and choosing "Database - Gotham Intel". Unlike the rest of the collectibles, Anarky Tags are not marked on the in-game map. After locating one, you have to scan it with Batman's detective vision. You will also get 5,000 XP for each Anarky Tag found. Batman Avatar Outfit: Successfully complete "I Am The Night" mode. Deathstroke Avatar Outfit: Defeat Deathstroke in Story mode. Joker Avatar Outfit: Successfully complete Story mode. 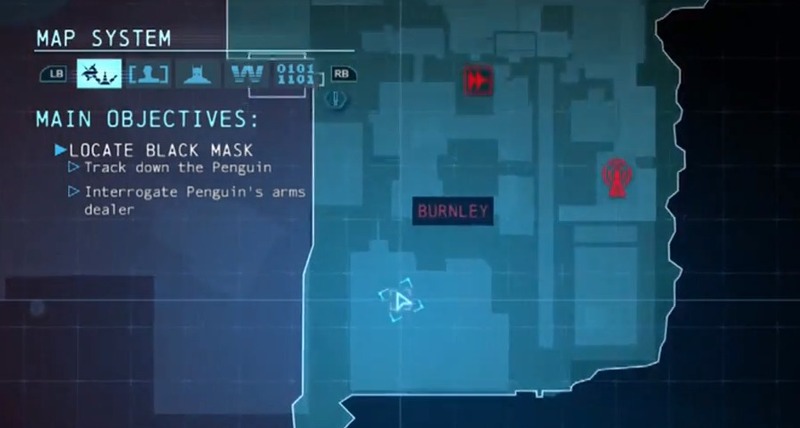 In the mission where you need to track down the Penguin on his ship (it is one of the first main missions in the game), after your encounter with Tracey (Penguin's assistant) and her goons, you will reach the first predator room in the game. Stay crouched, sneak up to an isolated enemy, and press Y to perform a silent takedown. Do this to all six enemies in the room, without being noticed, to get the "Anyone See That?" and "Silent Knight" achievements. Note: If you have already passed this point in the game, there are still plenty of other opportunities to get these achievements, but you should definitely do this before completing the story. After completing a predator room, the enemies will not respawn. 1. Batclaw Slam: Press LT + Y, X. 2. Explosive Gel: Press LT + X. 3. Concussion Detonator: Press LT + B. 4. Glue Grenade: Press RT(2). You will fight Deathstroke during a story mission, early in the game. Every time he attacks, you must press Y to counter him. Attack Deathstroke with Batman's normal strike. Doing so may initiate a QTE where you need to press the counter-button when it is displayed on the screen. If you press the button too early, or too late, your counter attack will fail, and you will get hit. If you get hit during the fight, pause the game, and choose the "Restart" option. The entire fight will start from the beginning, and you can try again. Note: It is possible to miss the Deathstroke fight in the story. If you miss the fight, you must start a new game and play until you reach the Deathstroke Boss fight to get the "Point Counter-Point" achievement. To get the "Point To Point" achievement, you must use the Grapnel Gun and glide across the Gotham Pioneers Bridge (the large bridge connecting the south and north of Gotham City). You can do this at any point in the game while in Free Roam mode (even after completing the story). No upgrades are required. Start at one end of the bridge, and keep shooting the Grapnel Gun at the wires to stay above ground. After shooting the Grapnel Gun, you must also activate the Accelerator by pressing A(2) to avoid touching the wires. You may not land at any point while crossing the bridge. If you do, you must start over. Shut Down (10 points): Shut down an entire Tower Network. Counter-intelligence (10 points): Decipher one Extortion File. Enigma Unravelled (15 points): Collect all Enigma items. First Riddler Trophy (30 points): Collect every collectible. One down, several to go (10 points): Complete a Most Wanted entry. The Innocent and the Predatory (25 points): Capture all of Black Mask's Assassins. Shadow Vigilante (15 points): Master the Shadow Vigilante Dark Knight track. Gotham Protector (15 points): Master the Gotham Protector Dark Knight track. Worst Nightmare (15 points): Master the Worst Nightmare Dark Knight track. World's Greatest Detective (15 points): Master the World's Greatest Detective Dark Knight track. Legend of the Dark Knight (25 points): Complete all Dark Knight challenges. Crime Scene Investigator (10 points): Complete all Casefiles. Crime Fighter (10 points): Stop 20 Crime in Progress. Thanks, old friend (10 points): Hear everything Alfred has to say. Personal Trainer (10 points): Obtain all the medals on Combat Training maps. Perfectionist (20 points): Obtain all the medals on Custom maps in Challenge mode. I've Got This (10 points): Acquire all upgrades. Free Flow Fifty (15 points): Reach x50 Combo. Anyone see that? (10 points): Complete a predator encounter without ever being spotted. What hit me? (15 points): Take down 100 enemies who didn't know you were there. Silent Knight (10 points): Complete a predator encounter using only silent takedowns. Point to Point (10 points): Glide across Bridge without touching ground. Around the World (10 points): Use the Batwing to travel to all Fast Travel points. Flawless Display (10 points): Successfully battle Shiva without taking any damage. Point Counter-Point (10 points): Complete Deathstroke without failing a single counter. One of Each (30 points): Use every Freeflow Focus gadget in one combo. Air Marathon (10 points): Glide 26 miles total. Medalist (40 points): Obtain all medals on the original Ranked Maps in Challenge mode (as Batman). Olympian (40 points): Obtain all medals on the original Campaign maps in Challenge mode (as Batman). Voice of the People (15 points): Scan 20 Anarky Tags. Clean Streets (40 points): Complete all Most Wanted missions. Give Them Something to Believe (50 points): Complete New Game Plus. Predator Paragon (25 points): Take down 6 different Elites in a match, using 6 different methods as Batman or Robin in multiplayer. Killing Joke (15 points): Reach max level with the Joker faction in multiplayer. Fallen Knight (15 points): Reach max level with the Bane faction in multiplayer. Gotham All-Star (20 points): Reach max overall level in multiplayer. Clutch (15 points): Kill a Hero to bring back your entire gang when at 0 reinforcements on a full multiplayer server. Tales of Gotham (25 points): Win a round of each map with each faction in multiplayer. I Like Those Odds (25 points): As a Hero, defeat 4 Elites within 40 seconds without using melee in multiplayer. Not An Ordinary Criminal (15 points): As an Elite, earn 4000 XP in a single multiplayer match. Arsenal, Awesome (20 points): Fully upgrade a weapon in multiplayer. Legend (50 points): Earn a level of prestige in multiplayer. Know Thy Enemy (25 points): Defeat each of the enemy players at least once in a multiplayer match. I Am The Night (70 points): Finish I Am The Night Mode. City of Assassins (10 points): Identify Black Mask's assassins. One eye open (15 points): Defeat Deathstroke. Nobody that matters (15 points): Who is the Joker? Everyone wears masks (15 points): Find the Black Mask. One Rule (25 points): Save a life. Perhaps sooner, Perhaps later (30 points): Defeat the Joker. Bruce's Revenge (25 points): Obtain all 72 medals on the original Arkham Origins ranked maps (as Bruce Wayne). Campaign Ninja (25 points): Obtain all 108 medals on the original Arkham Origins campaigns (as Bruce Wayne). Paint the Town Red (30 points): Find all Activist tags. Master Wayne (30 points): Take no damage when playing as Bruce Wayne. Let it Snow (20 points): Receive the Extreme Environment Suit (XE Suit). Drilling for Justice (20 points): Assemble the cryonucleation tunneller - the cyodrill. For Auld Lang Syne (40 points): Stop Freeze and bring Boyle to justice. Breaking the Ice (25 points): Free all the civilians frozen in cryogenic ice. Down with the Revolution (25 points): Stop Anarky thug operations in South Gotham. Snowjob (20 points): Get 3 enemies frozen in one attack. Stalact-tactician (20 points): Takedown 2 enemies with one stalactite. Come Out of the Cold (20 points): Perform 3 ice wall takedowns.